Pellets are a hot item. And that’s a problem—not in terms of economic interest but in terms of their corrosive potential. When pellets pass from the pellet press, they’re hundreds of degrees Fahrenheit. This is problematic for the conveyor that transports them from the press to the pellet cooler infeed chute. Because of the pellet’s temperature—and the hot, moist, acidic vapors they emit, the conveyors tend to corrode quickly. This leads to increased maintenance costs and shortens the life span of the conveyor. Pellet manufacturers face other problems with conveyors they use to move fresh pellets. Manufacturers have to treat their pellets gently; they don’t want to break them up and end up with a lot of fines mixed with the final product. For this reason, they stay away from augers, which break up whatever they’re moving, and opt for either pneumatic or belt conveyors. Both types of conveyors come with a set of issues besides corrosion. Belt conveyors take up a lot of room—you can’t run a belt conveyor at an angle more than 15 or 16 degrees because the pellets will roll down the chute. Long, low-angled conveyors therefore take up valuable floor space and may impede workflow traffic. And those extra feet of conveyor cost money. 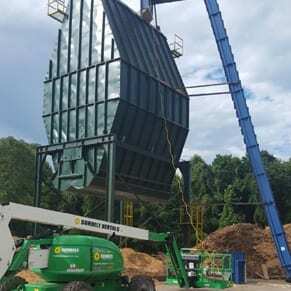 It’s because belt conveyors cannot transport material at steep angles, among other reasons, that manufacturers don’t employ them to transport sawdust to the pellet mill, which a typical pellet manufacturer will place at a higher elevation than other machines in the mill. A belt conveyor, of course, would take up far too much room to elevate sawdust, say, thirty feet inside a building. Belt conveyors are also “leaky,” so sawdust will fall between belt sections and potentially scatter through the air. There’s also no need for a belt conveyor because sawdust mustn’t be handled gently. So, manufacturers often opt to use pneumatic conveyors to transport the sawdust. While pneumatic conveyors take care of the dust and floor space issues—which is primarily why they’re used both pre-press and post-press to transport material—they’re less than optimal: they require large amounts of energy to operate. Say such a conveyor uses a 60hp motor to run. In the course of the conveyor’s lifetime, a company will spend tens of thousands of dollars to run it—many thousands more than for a belt conveyor. Pneumatic conveyors also aren’t don’t handle pellets gently, leading to extra fines that need reprocessed. These problems encountered by pneumatic and belt conveyors can be mitigated using our enclosed drag conveyors. Corrosion is less a problem with our drag conveyor. 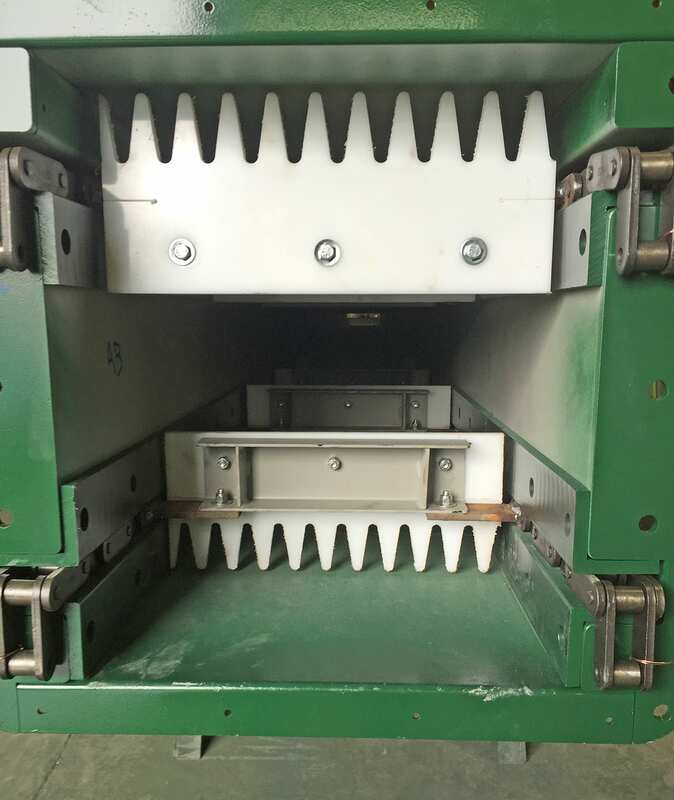 We can galvanize the conveyor or build it out of stainless steel, and because we move the paddles with dual chains placed outside the path of the pellets, the chain won’t corrode or decrease efficiency with friction like other paddle conveyors designs that have their chain running through the center of the material. Our drag conveyors are also enclosed—they can be made dust tight—so they better keep vapors and dust from escaping than do belt conveyors. The advantage of our drag conveyor compared to a belt conveyor is especially evident when considering space. 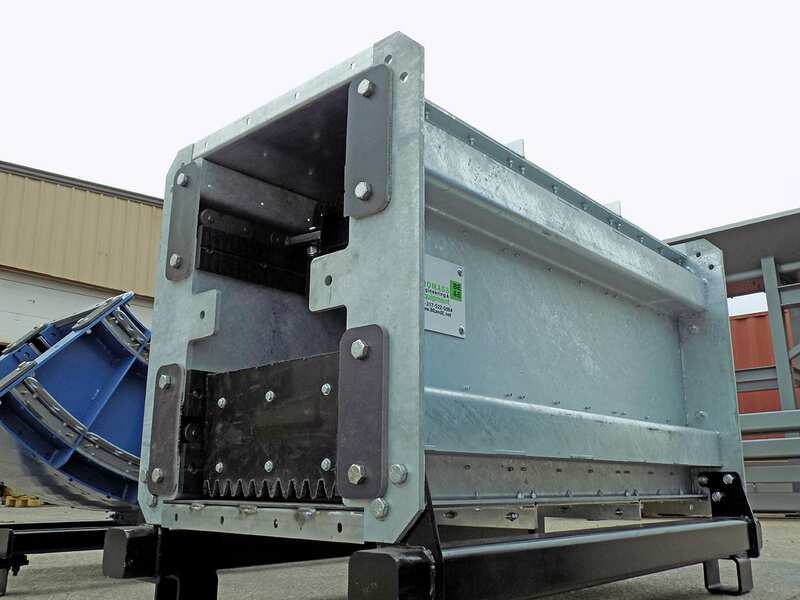 While some manufacturers opt for bucket elevators to overcome belt conveyors’ inability to move material at steep angles, buckets have serious drawbacks in terms of maintenance and performance. Our drag conveyors, however, can be built to move material at inclines up to vertical. They’re also easy to maintain and long lasting. Because these conveyors can move material at such a steep angle, they’re also an excellent choice to replace costly pneumatic conveyors. The advantage our conveyors have over pneumatic conveyors is their efficiency. Our conveyors can easily transport hundreds of tons an hour of material using only a few horsepower. As a result, you get to maintain a smaller engine and save thousands of dollars on energy costs. A drag conveyor will also handle fresh pellets more gently than a pneumatic. The drag conveyor will handle them gently, pushing them rather than breaking them up as an auger would; the “fingers” in our paddle design rake the pellets, thereby stopping them from compressing and breaking. 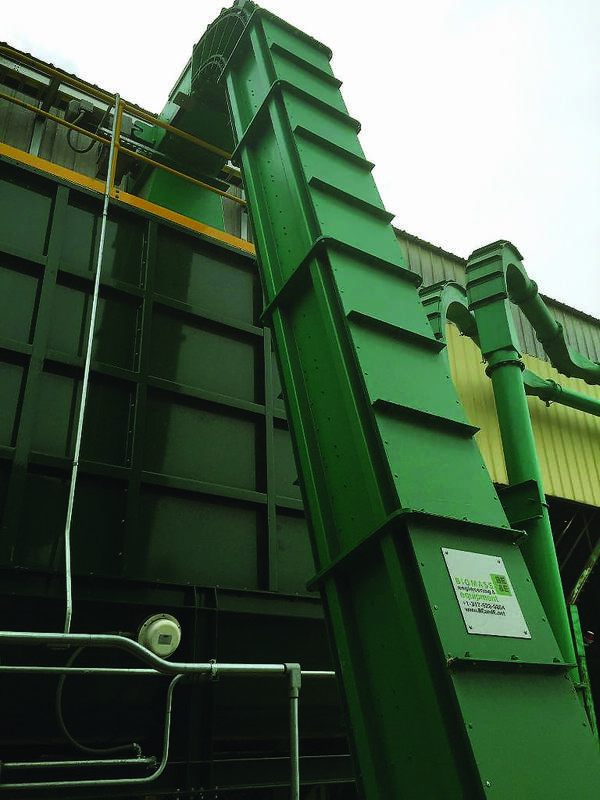 SMART drag conveyors from Biomass Engineering & Equipment are the right choice for your pellet mill. They convey material at much steeper angles than belt conveyors and trap dust and vapors. And they require far less energy and handle material more gently than pneumatic conveyors. 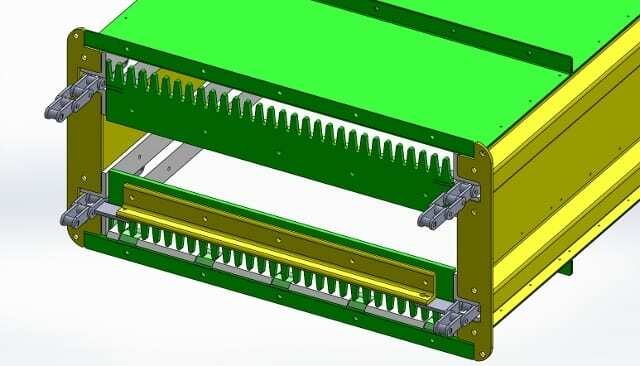 Go with something that will better serve you in the long run: a twin-chain drag conveyor from Biomass Engineering & Equipment. Contact us today to start a positive change at your plant. This article was posted in General and tagged belt conveyors, chain conveyors, drag conveyors, efficiency, industrial engineering, paddle conveyors, pellet mills, plant engineering, pneumatic conveyors. Bookmark the permalink. Follow comments with the RSS feed for this post.Post a Comment or leave a trackback: Trackback URL.